Building Mirror Frames from rough Cherry stock. I started with kiln dried rough 8/4 cherry. Jointed one side flat, planed the opposite side parallel to the first, bringing the finished dimension to 1 3/4 inches thickness. With the grain figure visible, I could mark out for the stock sections I planned to incorporate into the finished frames, and sawed out the various segments to 2 3/4 inch width. 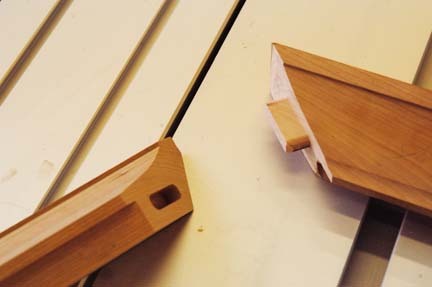 These segments were jointed flat and surface planed to the finished width of 2.6 inches. 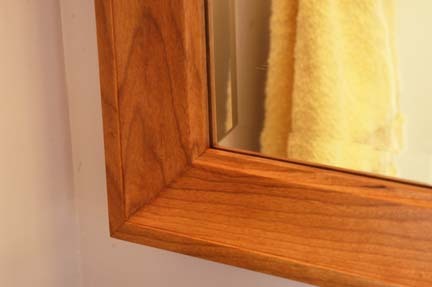 Once this was completed, I proceeded to machine the various profiles to obtain picture frame molding suitable for the beveled mirror panels I had previously ordered from a local supplier. This is the shaper setup for machining first profile on 1.75" x 2.6" stock. I'm using a Whitehill Panel Raising Cutter, tilted 10 degrees in overcutting position using a climb cut. 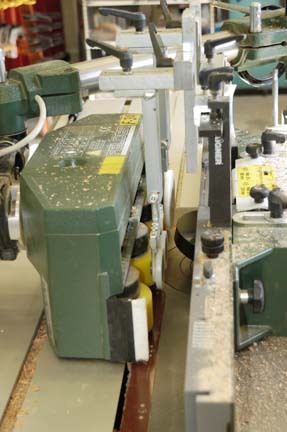 An Aigner pressure module is forcing stock down, with powerfeeder pressing stock against Aigner shaper fence. In retrospect, I wish I had machined both sides of double width stock and ripped the result to finished width. Doing so would have simplified the powerfeeder setup considerably. Live and learn. This is another view of the first profiling setup at shaper showing powerfeeder position. Getting this setup just right and rigid enough to muster a heavy climb cut took some time and a bit of trial and error on scrap stock. This is the resulting stock from first profiling operation. Now is the time to sand the profile after just being machined - not after the frames are assembled. This setup is for machining the rabbit to receive the mirror. Initially I tried using the Felder Guide Ring, but the mass of the ring is so large that stopping the ring from spinning caused excessive burning on the narrow stock edge. So I switched to this setup using the Aigner BowmouldMaster and Adjustable Curved Milling Stop, hand feeding the stock. Frankly, I think the Aigner Curved Milling Stop is a much more elegant solution than the fussy Felder Guide Ring set. 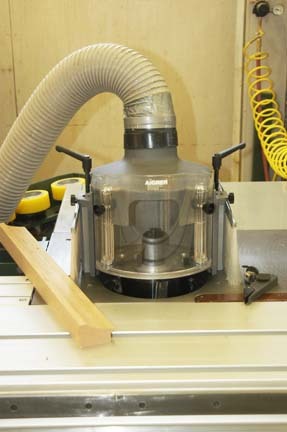 The rebate cutter is the Felder 150mm Rebate Head with "drawing cutters." I decided to use mitered mortise and tenon joints at the corners. To cut these, I used the Multirouter. Setting up the Multirouter for mitered tenons is pretty straightforward. 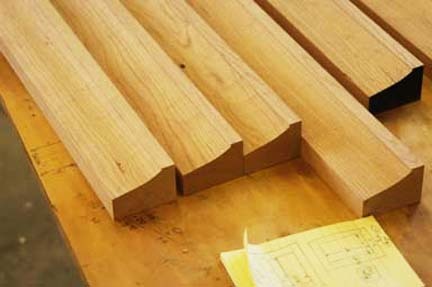 The only hitch is remembering to cut the stock over-length since machining the tenon also makes a new angled mating surface shorter by the length of the tenon. 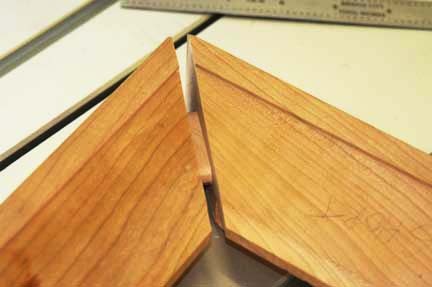 The mortise was cut on the Multirouter after making the mitered angle on a chop saw. Perfect miter joint fit after about 10 minutes fiddling with the mortise cut setup on the Multirouter. In the process of doing this setup I concluded the Multirouter would be enhanced by the addition of a 2nd and 3rd axis DRO. Getting this mortise accurately positioned would have been a breeze with that - as it was, this was pretty much trial and error to get the precise fit. 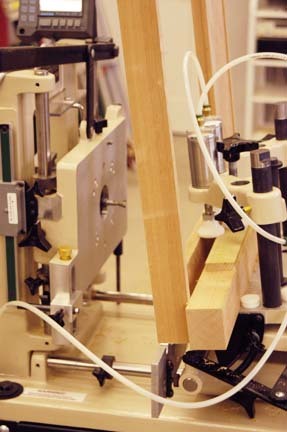 It is easier to clamp the frames with a square outside profile during assembly. I discovered on a previous project that if I angled the outside of the frame stock first, the Bessy clamps would force open the back of the miter joint during clamp-up. So at this point I assembled the frames using dark woodworkers glue and Bessy cross clamps. I decided I wanted the frames to sit flat against the wall, and elected to used a French Cleat method for installation. 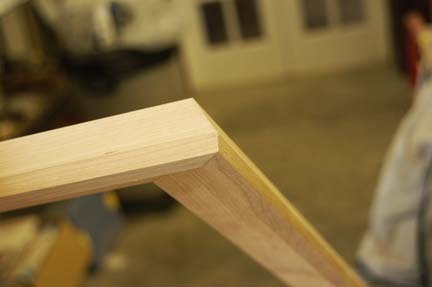 To cut the angled slot along the top inside back edge of the frame, I used the Multirouter again with a dovetail bit and the table angled at 10 degrees. This photo shows the setup. 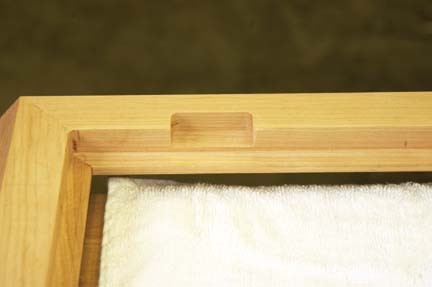 This photo shows the machined angled edge on the back of the assembled frame that will couple with a mating cleat on the wall after installation. To secure the mirror to the inside of the frame, I decided to machine cutouts for clamping blocks that would be screwed in place. 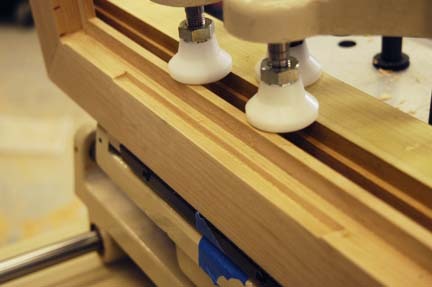 This photo shows the cutout for the clamping block. Here is the Multirouter setup for machining the cutouts on the back of the assembled frames. I used the same setup to widen the rebate for the mirror on two of the frames - having discovered the rebate space for the mirrors I had ordered was too small by 1/8 inch. 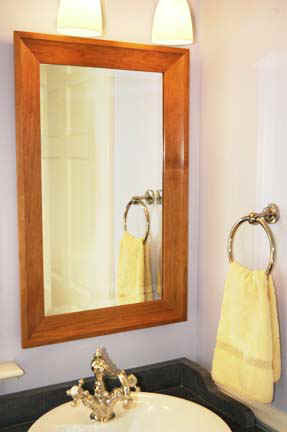 The lesson here is to order the mirrors after you make the frames if you can. For two of the frames, I wanted a beveled back relief. This was machined on the shaper after the frames were assembled. 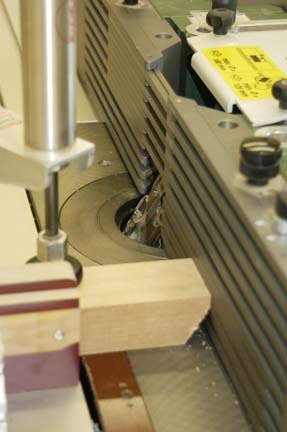 This photo shows the resulting back-bevel profile achieved. 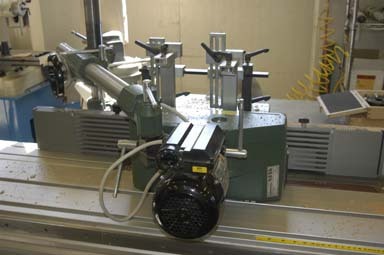 This is the shaper setup for machining the bevel relief profile on the outside edge of the assembled frames. 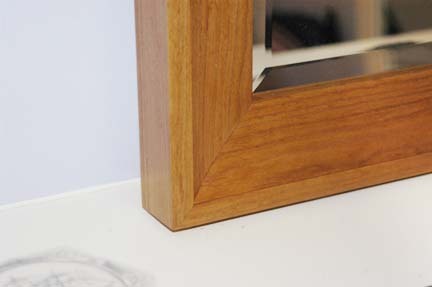 The cutter is a Felder Spiral Rebate Cutter at a 30 degree angle - which was ideal considering the brittle nature of the cherry grain. Although I used the Aigner fence, I ended up clamping the frames down to the slider and pushing the whole lot through the shaper. 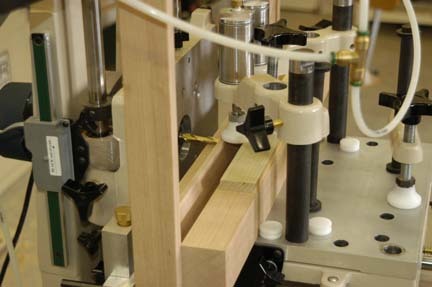 Shown here is the stop-block to prevent tear-out. I prefer a "rubbed oil" look, but don't have the patience to rub on the 10 coats of BLO that are required. So, after sanding, I decided to apply two coats of Poly/BLO/Tung Oil - wiped on and then wiped dry. Next I applied two coats of straight Poly wiped dry after each application (thanks to Brian Lamb for the suggestion) and 0000 steel wool after each coat dried. The final finish step was application of paste wax and buffing. Here is the detail of one of the finished frames. 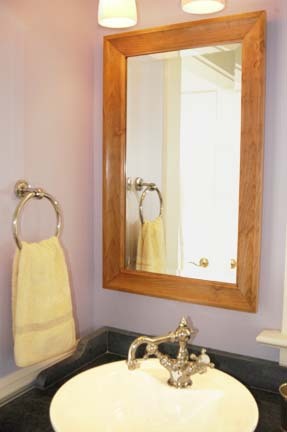 A pair of mirrors were installed in the mater bath as shown here. 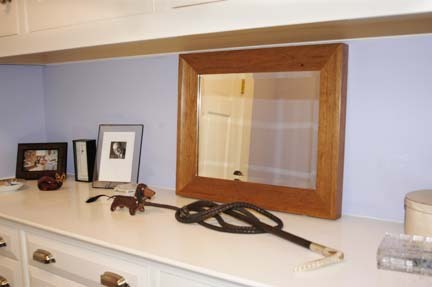 The third frame is used in the master closet to cover the fire safe. Since it sits on the counter instead of being hung on the wall, the outside profile on this frame is not beveled-back like the other two.